Congratulation on your engagement! We provide wedding rentals in Tucson from Chair rentals tucson to Tent rentals in Tucson, however this checklist is provided for you to use as a general reference, however it may be modified and personalized to your specific needs. 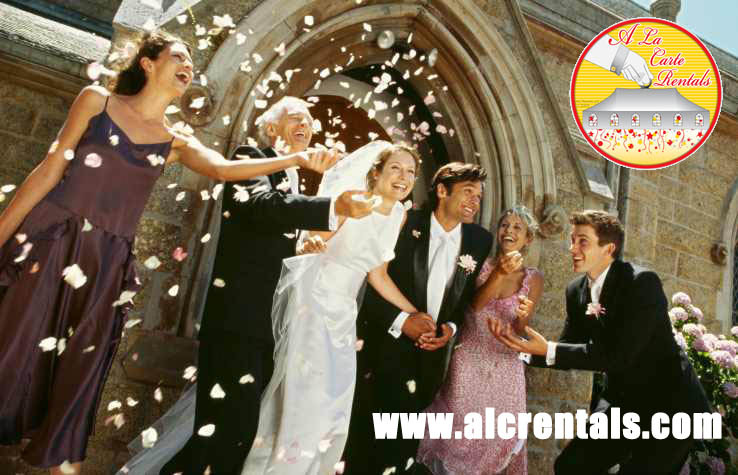 A La Carte Rentals wants to help you with the process of planning your perfect wedding. if you have any suggestions for this checklist, please contact us so that we consider them and add them to our list. ___Determine potential dates and times for your wedding. ___Decide on the size, formality and setting of your wedding. ___Create a wedding and engagement budget. ___Meet with and book your wedding officiant or clergy. ___Choose your wedding party and confirm the participants. ___Draw up an initial guest list. ___Order your wedding dress and attendants’ attire. ___Book your photographer and videographer. ___Arrange for decor, chair covers and linens.contact us We can help you. ___Book your live entertainment or DJ. ___Reserve any rental items from A La Carte Rentals. ___Register your gift choices at your favourite stores. ___Research accommodation for out-of-town guests. ___Reserve the musicians and soloist for your ceremony. ___Order your invitations and any other stationery. ___Order wedding favours for your guests. ___Choose outfits for mother of the bride and mother of the groom. ___Choose the reader for your ceremony. ___Finalize your order with the florist. ___Reserve the men’s wedding attire. ___Make an appointment with your hairdresser. ___Mail and e-mail the invitations. ___Decide on your wedding vows or compose your own. ___Confirm the wedding details with the musicians and clergy or officiant. ___Purchase gifts for parents and attendants. ___Make appointments for nails and make-up. ___Apply for a marriage licence. ___Plan the rehearsal dinner, Contact A La Carte Rentals for any rentals required. ___Meet with photographer and videographer. ___Have a party for the attendants.Again contact A La Carte Rentals for any rentals required. ___Call any guests who have not replied. ___Meet with your hairdresser and make-up artist for consultation. ___Deliver song lists to musicians or playlists to disc jockey. ___Call and finalize payment with all the vendors and write any cheques required for the wedding day. ___Determine the order for the procession. ___Pick up the attire for the groomsmen. ___Confirm the final numbers with the caterer. ___Confirm details with the limousine company. ___Deliver your marriage licence to the officiant. ___Draw up a seating arrangement for the reception and write out the place cards. ___Choose someone to hand out the bombonieres or wedding favours. ___Choose someone to return any rented items after the wedding. ___Give the wedding bands to the best man. ___Give the best man any cheques that need to be given out that day. ___Present the attendants and parents with their gifts. ___Relax and enjoy your special day! ___Make a gift list and send out your thank-you notes. ___Send thank-you letters to suppliers and attendants. ___If you are changing your name, you can purchase a kit to make the job easy. ___Arrange for cleaning and preservation of your gown.